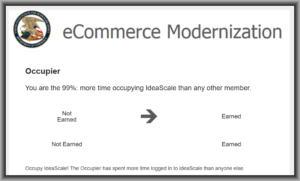 Wow I am an Ideascale Occupier! USPTO uses a system called Ideascale as a way to collect suggestions and comments from users of PAIR and EFS-Web and the alpha-test of Patentcenter (which will eventually replace PAIR and EFS-Web). There is a small but fairly dedicated community of USPTO customers who are users of these systems, who regularly post things to Ideascale. I am one of them. And I am astonished to learn that I have been awarded the status of “Occupier” in the Ideascale system at the USPTO. It turns out that the way a person wins this honor of being the “Occupier” is by being logged in at Ideascale more of the time than any other user. Sort of a dubious honor, perhaps, suggesting that someone is having trouble keeping busy or does not have enough to do! But anyway I have this status. 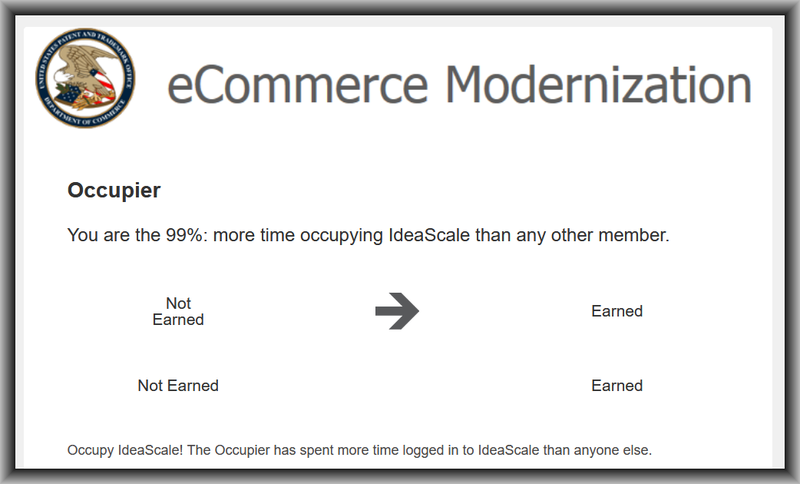 Occupier – The Occupier has spent more time logged in to IdeaScale than anyone else. Candidate – The Candidates are the members who have had an idea voted up by at least one other member. Warhol – The Warhol is a member who has spent 15 minutes on IdeaScale. Judge – The Judge is a member who has commented and voted on 1 idea (not necessarily the same idea). Apprentice – Unlocked for all new members upon registration. Marconi – The Marconi is awarded to members who have sent at least one email out of IdeaScale. Team Player – The Team Player is awarded to members who have contributed an idea. Anyway if you have not already done so, you might want to join USPTO’s Ideascale system so that you can post comments and suggestions for the improvement of EFS-Web and PAIR and Patentcenter. Award to compensate for the fact that the USPTO won’t actually adopt any of the suggested ideas? Yeah, it is really quite rare that USPTO actually adopts any of the (very sensible) suggestions from people in Ideascale. My chief motivation for spending time and energy with Ideascale is that USPTO has signaled that it won’t accept feedback from its alpha testers (of Patentcenter) by other means, and so the only way to provide feedback and bug reports in Patentcenter alpha testing is to post a message detailing the bug or the suggestion. And so as an alpha tester of Patentcenter I find that I need to log in at Ideascale at least once a week to post bug reports and to comment on bug reports posted by other alpha testers.